It is difficult to comment upon the latest Ridley Scott film, Kingdom of Heaven , without drifting off into what it implies about faith and religion and how it resonates with the current escalating war of Yaweh and Allah’s battles over the kingdom of Middle East earth. The film didn’t do all that well at the box-office, maybe because the Crusades are rather an obscure history to Americans, or because Orlando Bloom (Balian), who is cast as the moral male lead does not seem larger that the broadsword he has to wield. But you have to like a guy who rams a red-hot sword into the guts of a priest who has just had Balian’s wife beheaded before her burial because she supposedly was a suicide. Up to that point Balian is just a humble blacksmith (with rather skinny arms). As it happens, Balian’s father, crusader knight Sir Godfrey, arrives and invites him to Jerusalem, where the son becomes heir to his father’s estate and army and an almost invincible knight. The almost courtly dialogue seems apt to the period, although it will likely put off viewers weened on F-word variations. But what seems to make this movie work is Scott’s attention to detail in location, set design, and the sheer historical period “feel” of the production design of the picture. Having spent a little time in North Africa and the Middle East what “nailed” it for me was the light . If you have ever looked at the watercolors of Napoleon’s artists from his Egyptian campaign, or paintings of Jerusalem, you can’t help but notice the creamy, almostcafé au lait light (even though it was shot in Spain and Morocco). It’s different than the illumination we get in temperate climes and different from that the klieg-sh back-lit glare of many a Speilberg film. And when somebody is in a room with a candle the only light you get is confined to its penumbra. Paradoxically, it is the attention to light we used to see in good black and white films. The light “puts you there”; that’s worth the price of admission for me. But there’s more than light to Scott’s movies. Another appealing aspect of his films that I have come to see as his “theme” is the calling upon of flawed (even if slightly) men (and women) to confront large issues and historical circumstances. There is Maximus, theGladiator , a guy who would prefer to farm in Spain rather than slice and dice his buddies in the arena; there was Dekkhard, the reluctant Blade Runner , who would press his investigations of replicants right up t the point of wondering if he was one as well; or Ripley, the Alien fighter in the tight tank top who ends up having a curious relationship with them; even Thelma and Louise battling getting groped and played for dopes and choosing “death victory” over the certainties of male justice. Balian seems the least flawed (other than physical stature). Save for the guilt he feels for exterminating that slimy prelate he seems refreshingly secular, and more concerned with protecting those who need protection (a knightly code) than with the acquisition of power and slaying of infidels of the crusaders. These are big themes, seeming to require equally-sized movies. They seem to deal a lot with invasion – Goths, Replicants, Aliens, uppity Women, and Muslims in the Holy Land – and heroes and heroines called upon to overcome their human failings to “do the right thing.” I think that Scott did the right thing to release Kingdom of Heaven into a post-911 world; it’s a view, although not always accurate (but then noting is accurate where faith is concerned), into the soul of people who can say with such conviction that “God wills it.” A perspective through which we might see the deep, deadly roots of the current malaise, in which the oft misspoken use of the word “crusade” by G.W. Bush seems to speak a truth we don’t want to consider. That brings up the third aspect I like in Ridley Scott films—the guy knows how to do war, at least the way armies used to do war. The siege scenes by the armies of Saladin have the same incendiary “artillery” barrages and brutal mano a mano combat that we remember from the opening scenes of Gladiator . The hegemony of Jerusalem has changed many times, as churches have become mosques and then back again, as the cross and the crescent have exchanged places atop its walls. In this account, Balian sues for peace and surrenders Jerusalem, to withdraw from the Holyland (the Knights Templar had already left to take their place in The Da Vinci Code ). Since then, Jerusalem has returned to Israeli hegemony, but one wonders if there is another chapter to the saga of The Kingdom of Heaven . 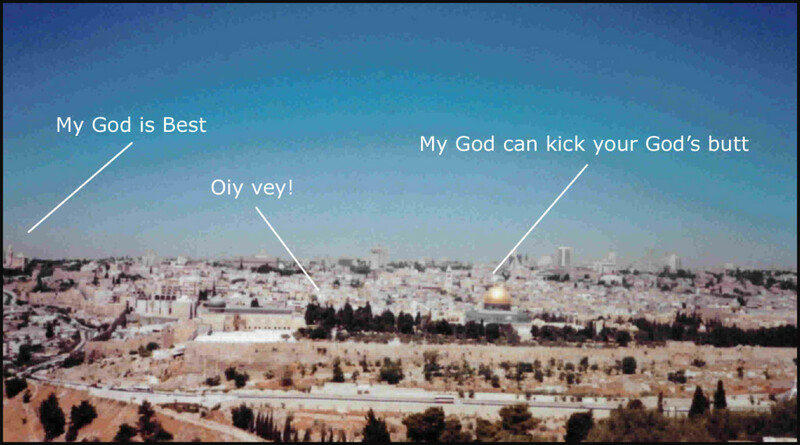 Jerusalem—“house of peace”; will it ever be thus.